Consider the setting where treatment is a limited resource so that a fixed proportion of the population can receive treatment. We wish to assign the treatment resource to subgroups of the population (based on their covariate information) to maximize the population mean outcome. Consider the greedy treatment assignment strategy which prioritizes treating the groups that will benefit most from treatment. 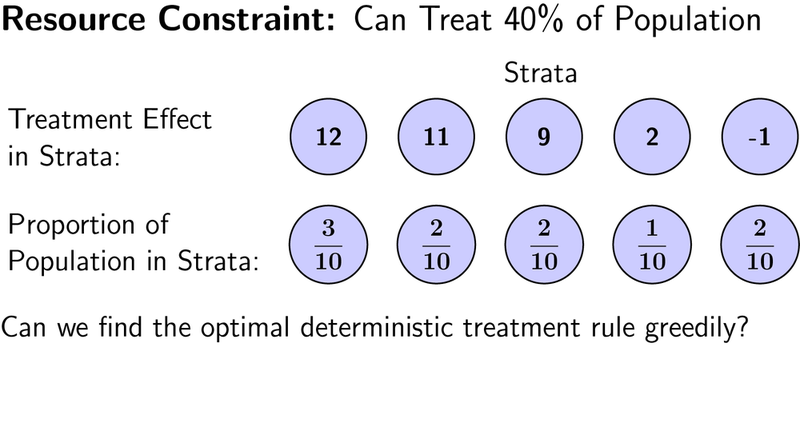 In the unconstrained case this strategy is optimal, but in the constrained case it can be suboptimal. This ties to the 0-1 knapsack problem from combinatorial optimization, which is a surprisingly difficult problem (NP-hard) given how naturally it arises.